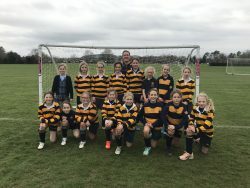 Cranleigh Prep School played their first girls’ football fixture on Tuesday. Sixteen Form 3 and 4 girls represented the School in two 7 a-side matches against Parsons Green Prep School. The enthusiasm for the game had been building for a number of weeks and the excitement from both sets of players was palpable before kick-off. Our opponents had played a few fixtures prior to this so we knew that it would be difficult to transfer the skills learnt in training and put them under competitive pressure. However, the girls played amazingly. The ‘B’ team lost a well fought match, with Amelie L scoring our goal. The ‘A’ team match was equally exciting. The girls were fantastic, running out 8-2 winners. Team coach and Head of Football, Chris Stone, says “Goals from Amelie W, Lucy W, Charlotte B and Sienna R gave us a resounding victory and the confidence that we can continue this avenue of girls’ sport in the forthcoming months and years”.